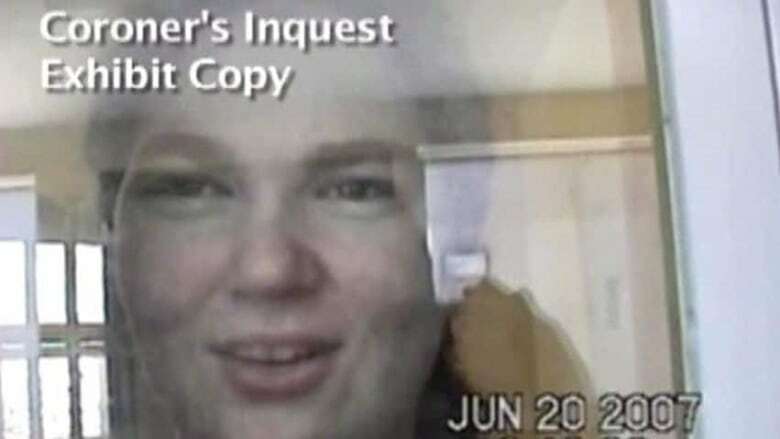 The opening day of the inquest into teenager Ashley Smith's death in a federal prison adjourned after the presiding coroner called the probe "the best memorial we could give to Ashley", and jurors heard testimony from a correctional employee. The opening day of the inquest into teenager Ashley Smith's death in a federal prison adjourned after the presiding coroner called the probe "the best memorial we could give to Ashley," and jurors heard testimony from a correctional employee. Smith, 19, choked to death on Oct. 19, 2007, after tying a piece of cloth around her neck while prison guards stood outside her cell and watched at Grand Valley Institution for Women in Kitchener, Ont. The guards say they had been ordered not to intervene. Dr. John Carlisle, in his opening remarks in Toronto on Monday, called her death a "tragedy." "We cannot now reverse the course of history as it unfolded, but we can learn from the circumstances of this death, and try … to implement measures to prevent future tragedies …. What's done is done," Dr. John Carlisle said in opening remarks Monday. "What matters now is the sincerity and success of our efforts to make from it something that can benefit the future." The inquiry, which is set to reconvene Tuesday morning, is expected to last anywhere from six months to as long as a year. The five-woman jury will be presented with roughly 8,000 documents and roughly 100 witnesses, the CBC's John Lancaster reported. This is the second inquest into Smith's death. The first attempt went off the rails amid acrimonious legal squabbling and was scrapped after the first coroner retired. The opening day of evidence included testimony from Leslie Milbury, a project manager for Correctional Services of Canada, who detailed the litany of charges that Smith had been hit with for disciplinary reasons while behind bars. Milbury also walked the jurors through the number of times Smith had been transferred between correctional facilities — 17 in the last year alone. The probe was adjourned for the day to allow the jurors to read a report from the New Brunswick Ombudsman and Youth Advocate on Smith. On Thursday, jurors are expected to visit Grand Valley Institution in Kitchener, Ont. And in the coming days, the probe will view a videotape of Smith's death recorded by guards, said Jocelyn Speyer, the coroner's counsel. "We will watch it, because it provides an accurate account of what happened," she said Monday in her opening remarks. "It's most disturbing, but it's necessary. No other evidence can convey as accurately and fully what happened, how long things took, the tone [in] which things were said, and how it appeared to the correctional officers who were watching." Jail guards who were present when Smith died are also expected to testify next week, she added. Howard Rubel, the lawyer representing the guards, told CBC News that his clients are anxious to tell their story. He said they brought their concerns about the teenager to the attention of prison managers on numerous occasions, but were rebuffed. "They were repeatedly being told, 'No, we know what we're doing. You follow the treatment program. You follow the rules we have set. We have experts we have consulted with. This is the only way to deal with her safely and effectively,'" Rubel said. The family is bracing for not only a barrage of painful testimony and accusations, but also for their personal lives to be under scrutiny, said Julian Falconer, the lawyer representing them at the probe. "It's literally right out of the manual that whenever I've represented parties seeking accountability from correctional services, it's meant that they go on trial," he told CBC News in an interview outside the courthouse." So we can expect that information, confidential information about Ashley and her own challenges are going to come out. And that's going to be part and parcel of the price that the family pays for asking for accountability." Smith's family hopes the public hearing will provide some answers to long-held questions about what happened to the teenager five years ago. In an exclusive interview with CBC News, Coralee Smith and her daughter, Dawna Ward, said it has been a five-year fight at every turn to try to find out what happened to Ashley. The family members told the CBC's Maureen Brosnahan that they even had to fight to get access to Ashley's remains after her death. "We waited and waited and waited and couldn’t get answers from anyone," Ward said. "No one could tell us when her body would be released, no one could tell us. We literally knew next to nothing. "I did ultimately have to call the coroner on day seven or day eight and say, 'What exactly is going on? Why are you not releasing her body? Why are we not able to make these arrangements?'" she said, adding that when the body was finally released, "we couldn't even find out at the airport even the flight she was on." The family made several calls to prison staff but was given little information about the circumstances surrounding the death, according to Ward. "A little trickle of this information and that information," she said. "It was horrible, absolutely horrible. It would have been so much, so, so much easier, really on the whole family had someone said: 'Here, here's what took place. Here's what was taking place prior to her death and here's what took place, and this is what we plan to do.'" Since then, the family and its lawyer, Julian Falconer, have taken the Correctional Service to court to obtain relevant records of the teen's treatment in prison. "There is a rich record of the horrendous conditions that Ashley Smith was in," said Falconer. He expects much of that will come out at the inquest. But given the adversarial legal system, he predicts it will be difficult on the family. "The family's private life will be on trial and there will be numerous, numerous tactical considerations as efforts are made to distract attention from the main actions of Correctional Services," he said. "But suffice it to say they have been braced for this for years and they are anxious that the truth come out." The troubled teen had a history of acting out. She first ran into problems after throwing crabapples at a postal worker. She spent three years in provincial custody — most of that in segregation. She was then transferred to the federal system because they promised they could offer her help and treatment, according to her mother, Coralee Smith. Smith says in October 2007, she expected her daughter would be released in time to return home for Christmas. "The only thing she did say at her last phone call was, 'Mom, I don't know how I'm going to react when I get home?' and I said to her that's fine … I even set up a little space for her at the end of the hall, small room, with a TV and lounger, to make a space for her so she could cope with all of a sudden being let out of segregation." But a few days later, Smith said that all changed. "You expect your baby's coming home in 43 days … instead, she's coming home in a pine box." In her last year of life, Ashley Smith was shunted 17 times to nine different prisons in five provinces after staff found her too difficult to handle. She spent most of that time in segregation. She repeatedly tried to harm herself; actions that some prison staff insisted were merely efforts to gain attention. Smith's family said they knew little of how Ashley was being treated. Ward says during phone calls home, she divulged only a little of what was being done to her. "She never even once said to me, ‘You don't know how difficult it is,'" Ward said. "We would encourage her and say, 'Ash, just do what you're supposed to do and mind the rules and be respectful and be polite to people, and we're going to get you home and everything will be fine,'" Ward said. "I'm trying, I'm trying so hard,' is what she said over and over and over again. 'I'm trying real hard to behave." Videos of Smith's treatment, released after a lengthy court battle, were aired publicly last fall. They show teams of guards dressed in riot gear, physically restraining Smith, forcibly injecting her with drugs, covering her head with a mesh hood and duct-taping her to an airplane seat. A pilot on an RCMP plane even threatens to duct-tape her face. The girl is heard on the videos crying plaintively and pleading with staff not to hurt her but to help her. The release of the videos caused outrage across the country. It prompted Prime Minister Stephen Harper to order the Correctional Service to end its court challenges and co-operate with Ontario's coroner's office to allow the inquest to proceed. At issue in the inquest is the prison system's ability to deal with inmates who are mentally ill. Prison officials say much has changed since Smith's death more than five years ago. But Canada's Correctional Investigator, the ombudsman for prisons, Howard Sapers, said in his latest report that while Correctional Services of Canada has spent close to $80 million on studies, reports and basic training for staff, little has changed. Coralee Smith, who was not able to attend the start of the inquest Monday due to her frail health, says she hopes it will lead to tangible changes in the system to ensure no one else goes through what her daughter endured. "We still have Ashleys, we still have Ashleys being treated in the same tortuous, horrendous ways that Ashley was treated," she said. "The money they're using, the money that's being spent keeping people in prison, could be much better directed … at mental health services way before they get to the courtroom, way before." "Every single person in this country should be concerned that what happened to Ashley is happening to so many others," said Kim Pate, executive director of the Elizabeth Fry Societies of Canada. Pate was actively intervening, attempting to help Smith when she died. The prison system has become the dumping ground for the mentally ill, according to Pate. "It's the only system that can't say 'No'," she said. "Instead, they should be being assessed and moved over to the Mental Health System for the requisite supervision, support, whatever is needed, treatment mostly." She says there should be arrangements in every province and territory that would allow inmates with mental health issues to be treated in hospitals, not prisons.